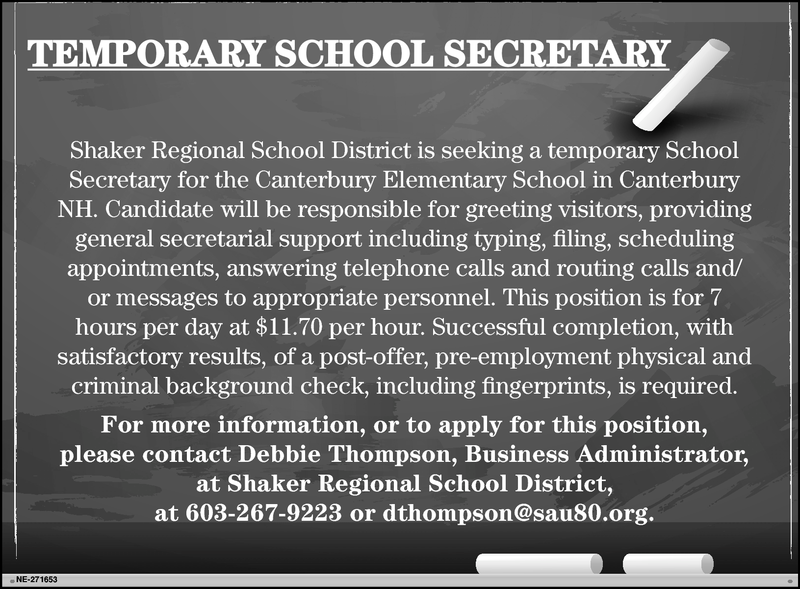 Shaker Regional School District is seeking a temporary School Secretary for the Canterbury Elementary School in Canterbury NH. Candidate will be responsible for greeting visitors, providing general secretarial support including typing, filing, scheduling appointments, answering telephone calls and routing calls and/or messages to appropriate personnel. This position is for 7 hours per day at $11.70 per hour. Successful completion, with satisfactory results, of a post-offer, pre-employment physical and criminal background check, including fingerprints, is required. For more information, or to apply for this position, please contact Debbie Thompson, Business Administrator, at Shaker Regional School District, at 603-267-9223 or dthompson@sau80.org.